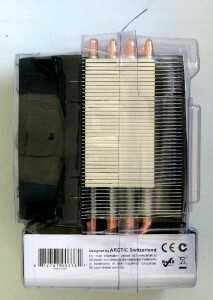 Known for their thermal interface material (which is used in all of my reviews), Artic has sent over the Freezer 13 heatsink for testing. This cooler can handle up to a 200 watt heatload according to their specifications. 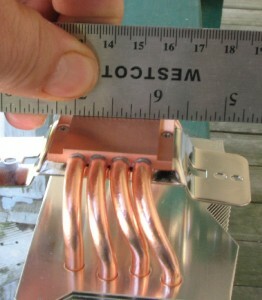 Our test system can easily match or exceed this wattage, so it will be easy to test Artic’s claim. There is some pretty formidable competition within this price point, so this review will explore how this cooler stacks up to its peers. 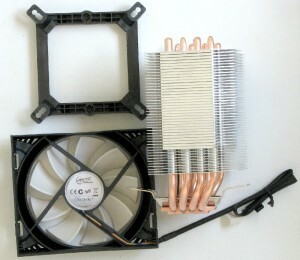 Arctic Cooling was founded in 2001 as a company offering quiet cooling solutions for desktop PCs. They began by focusing their line in Switzerland and Germany and then expanded to Asia with the founding of Arctic Cooling (HK) Ltd. and finally made it across the Atlantic to the North and South American markets in 2005. Today they also offer quite a diverse selection of equipment besides CPU coolers such as GPU coolers, excellent thermal interface materials, power supplies, headphones, peripherals and even offer some RC boats. 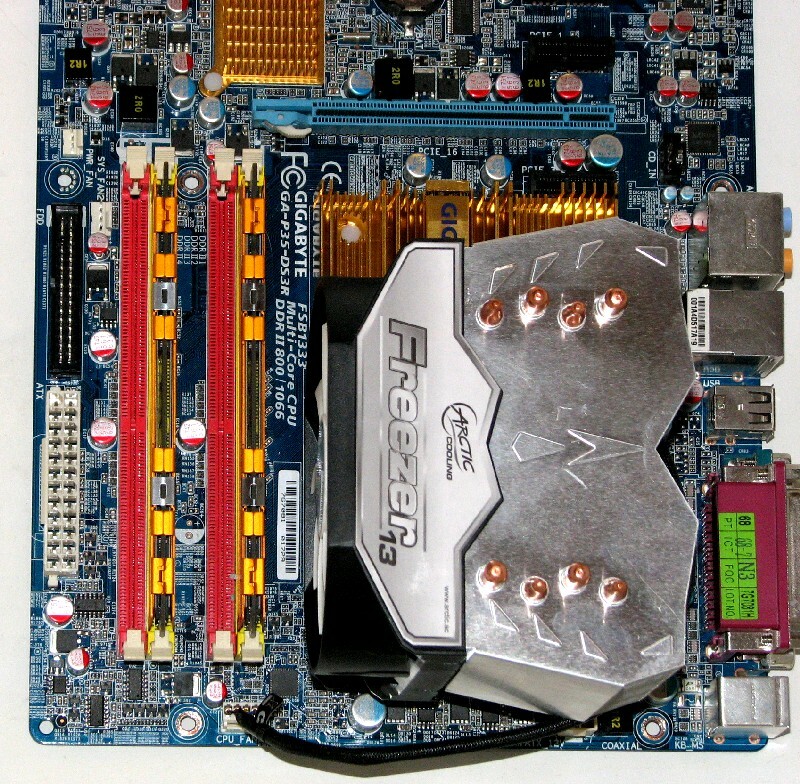 A truly diverse selection of hardware from starting off with just heatsinks in ten years. And in recognition of their changed offerings not related to PCs, Arctic Cooling changed their name to Arctic in 2010 (not to be confused with Arctic Silver). 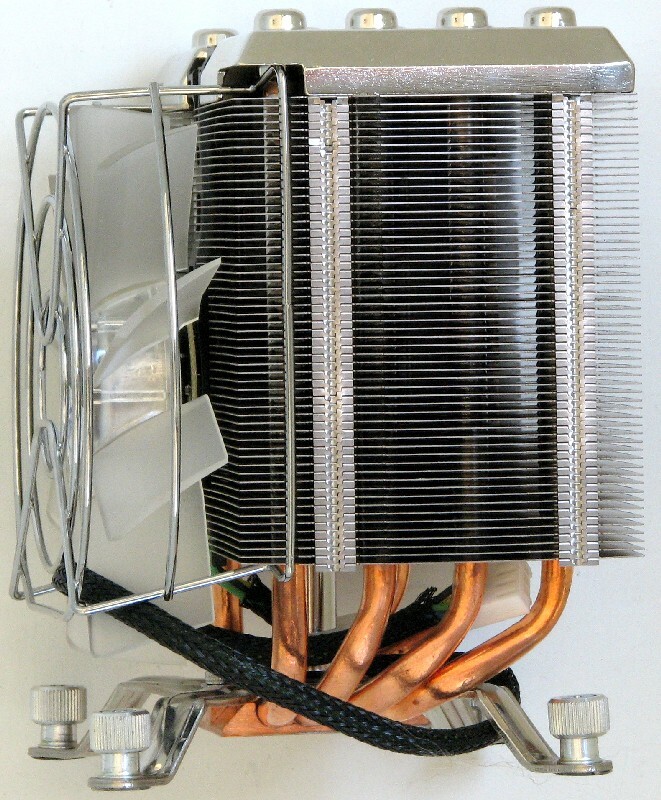 Superior Cooling Capacity – With detailed engineering design, the Freezer 13 comprises of four U-shaped high performance heatpipes and 45 efficiently formed aluminum fins. The maximum cooling capacity for this cooler is 200W and is able to dissipate massive heat that is produced in high-end CPUS, such as Intel Core i7. 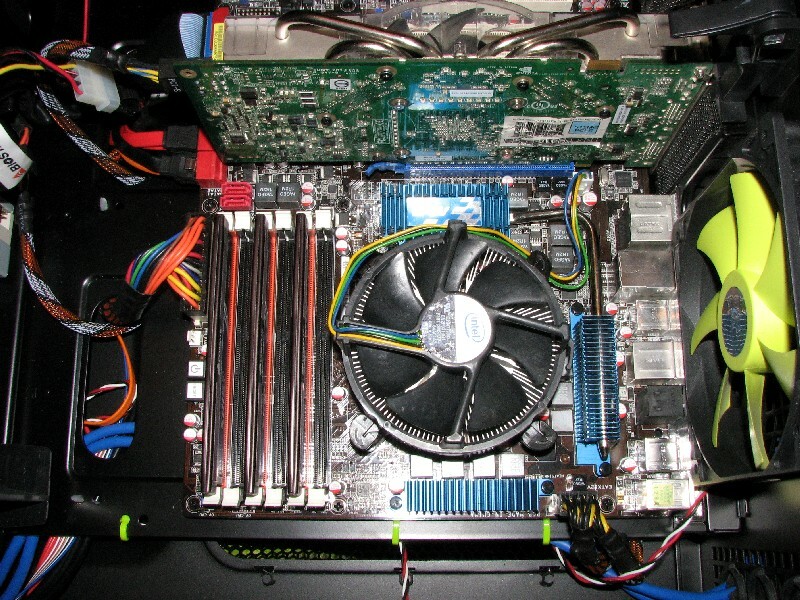 Ultra Quiet – Operated with a 92mm PWM fan, the entire running operation remains whisper quiet, even at full load. 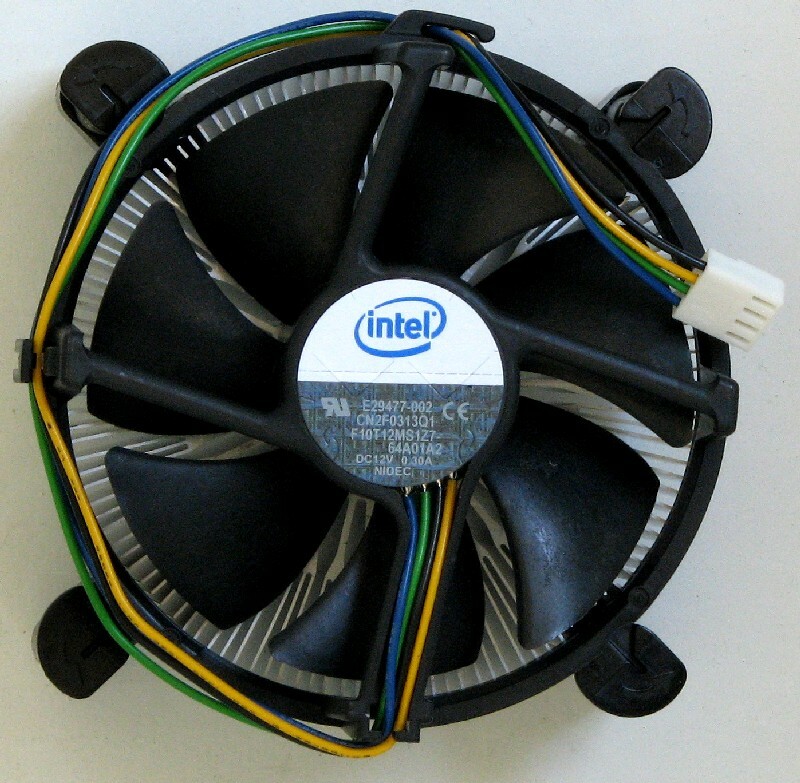 The fan speed normally runs from 600 to 2000 RPM, which is sufficient to maintain your CPU at ideal temperature. 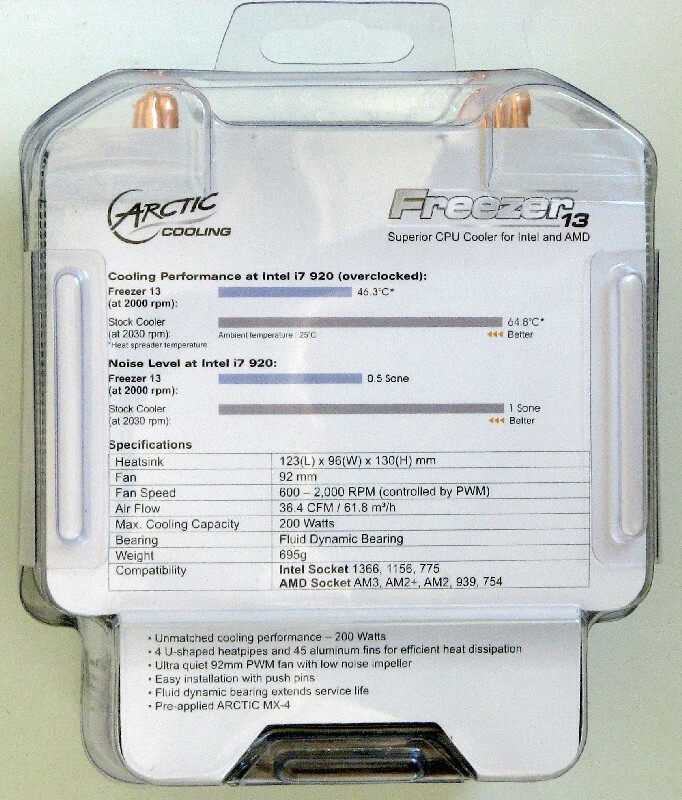 Multi Compatibility – The Freezer 13 features wide compatibility with AMD and Intel sockets. Its simple mounting system is designed to fit all current CPU platforms which makes this cooler to have a broad usability and brings overclocking to a new level. Easy Installation – The unique mounting system via push pins offers excellent stability and is applicable within seconds. The pre-applied ARCTIC MX-4 thermal compound makes the installation a quick and clean process. Looking at the features and specifications listed by Arctic, I am having some doubts whether this heatsink will be able to handle my overclocked i7 930 right off the bat. 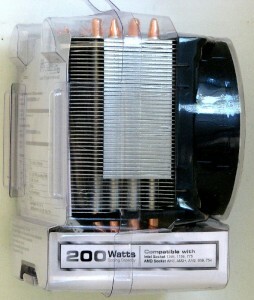 They are claiming a maximum cooling capacity of only 200 watts which this overclocked test system is pushing (and more). They also chose a 92 mm fan instead of the now more common 120 mm fans that the majority of the competition has gone to in tower style heatsinks. 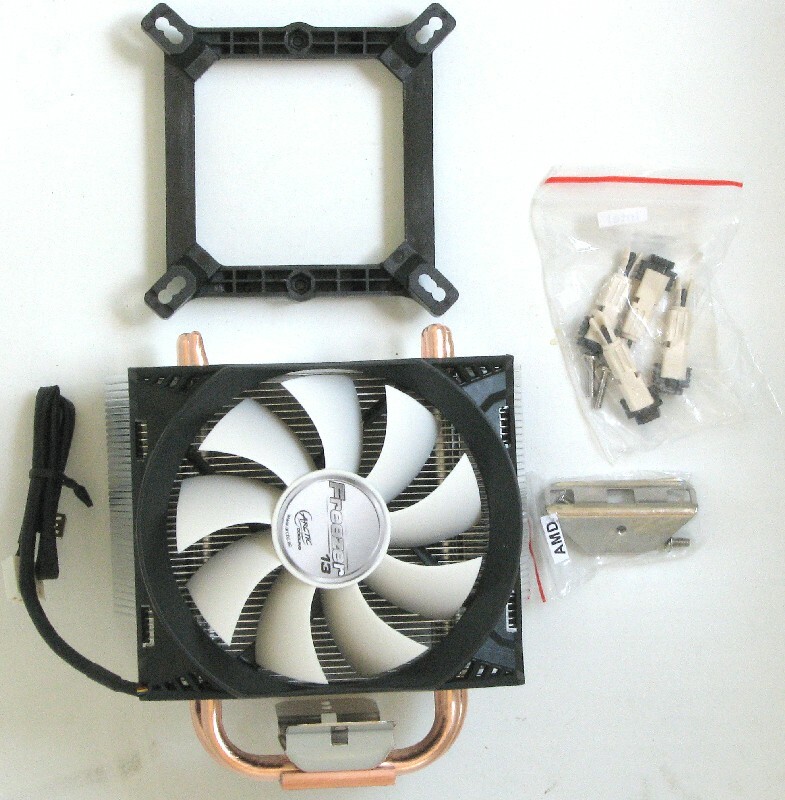 The basic layout of this heatsink is much like the earlier Freezer 7 Pro and is basically a slightly enlarged and improved version of it and uses a shrouded 92 mm fan instead of the open frame fan of the Freezer 7 Pro. 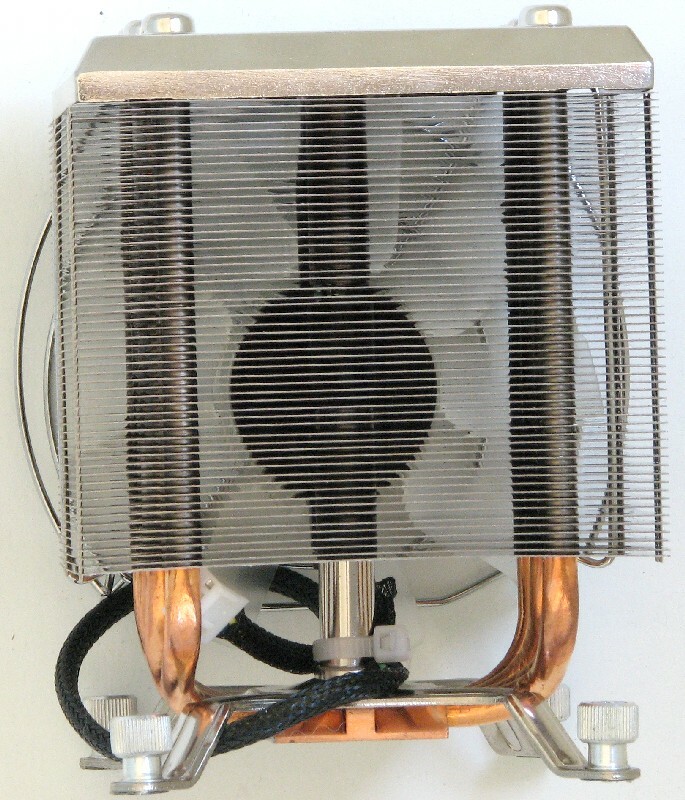 The Arctic Freezer 13 is another “out of the box” solution, with a proprietary 92 mm fan built into the intake shroud and mounting equipment for any modern Intel or AMD system. The bare heatsink had a measured mass of 578 grams and the fan assembly came in at 101.4 grams. The proprietary fan/shroud assembly means that you won’t be upgrading to a high cfm fan to improve cooling down the road, but does simplify fan mounting. 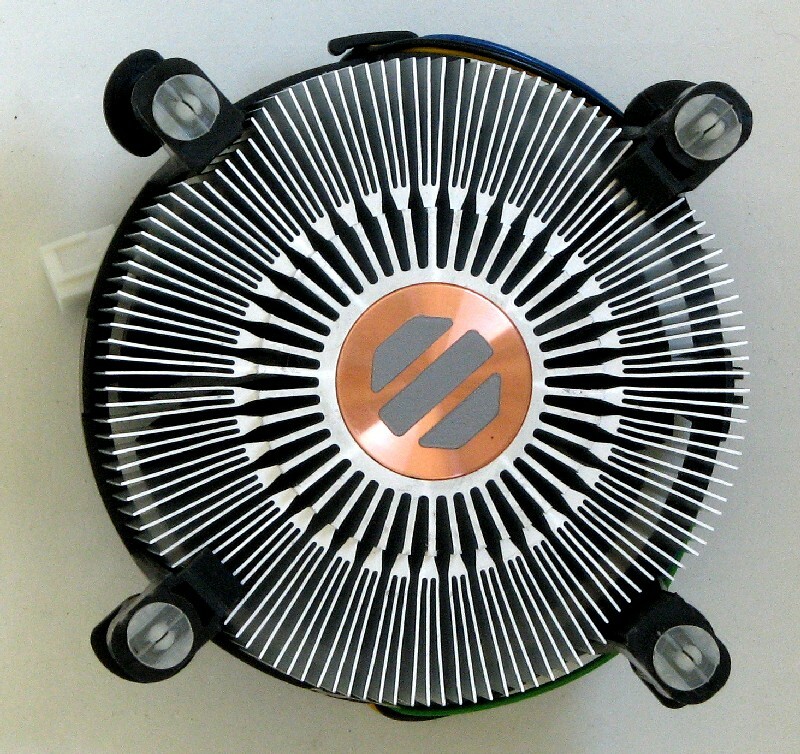 This heatsink is also asymmetric in design and the fan/shroud assembly only fits on the heatsink one way. 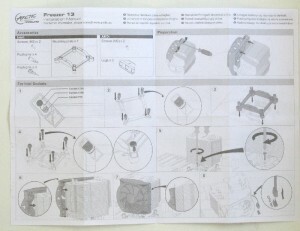 The Freezer 13 ships in plastic packaging that closely fits around the assembled heatsink/fan assembly with the mounting hardware at the bottom by the heatsink base. The plastic packaging is a resealable clamshell and provides some protection against shipping damage, but isn’t nearly as secure as a proper box would be, like the Havik 140 or Zalman CNPS9900 Max used. 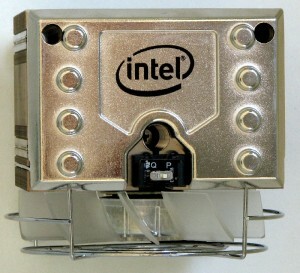 The back side of the clamshell has the the marketing information comparing it to a stock Intel heatsink and also has some specifications of this heatsink. 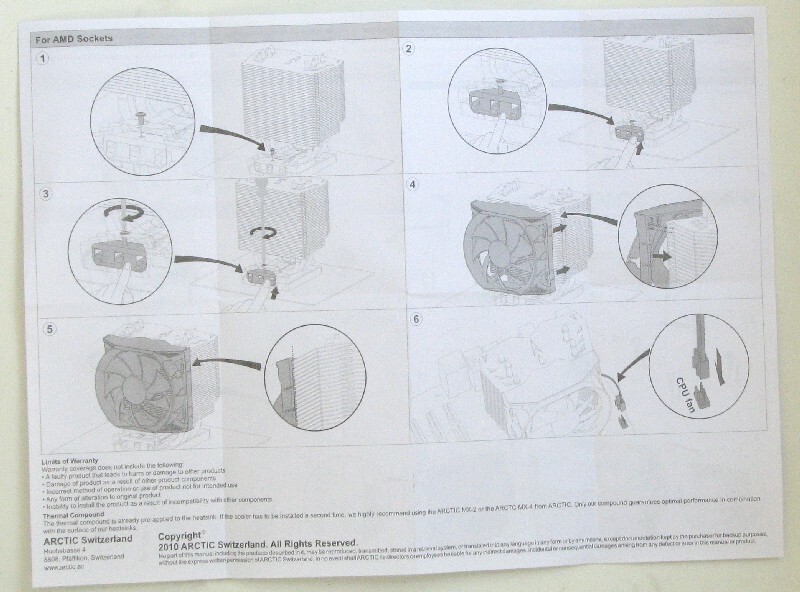 The sides of the packaging are clear giving a good side view of the heatsink inside the clamshell. Arctic didn’t spend a fortune on packaging this heatsink, but I guess the packaging protects it enough during shipment since it arrived undamaged from overseas. After removing the heatsink and mounting hardware from the plastic clamshell, we are looking at a compact and rather conventionally designed tower heatsink. 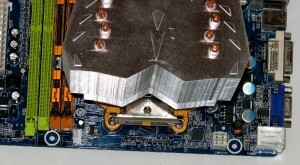 The heatsink fin area gets larger from front (fan) to the rear. This is why the heatsink is directional and can only flow air in one direction. 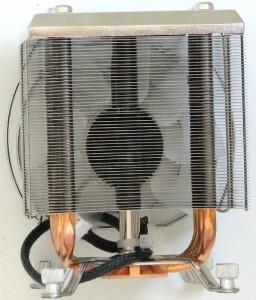 It has four 6 mm heatpipes coming up from a copper base plate and into the fan body. The Intel mounting hardware consists of a cross-platform retention module (RM) frame that has three different sets of mounting holes for LGA775, LGA1155/1156, and LGA1366 platforms. You simply pick the corresponding holes for your platform and then insert the bottom half of a type of pushpin assembly into the hole. 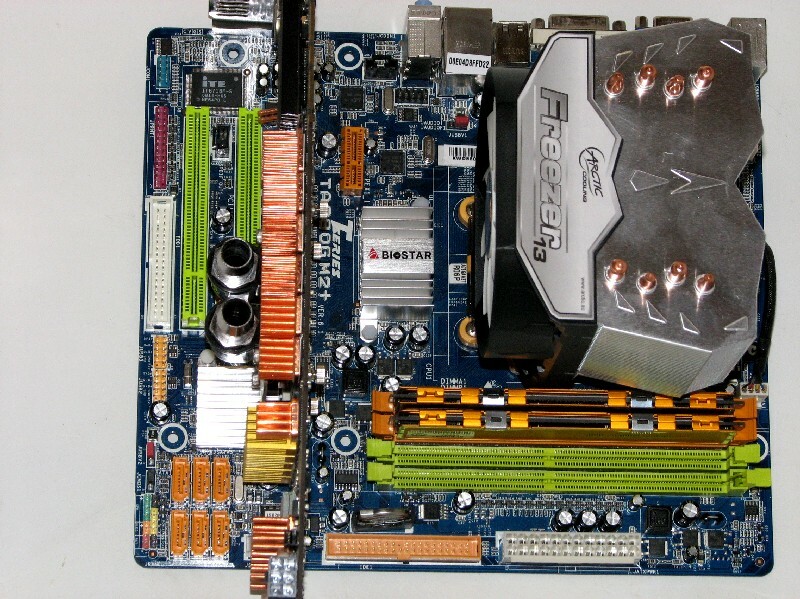 You then set the frame onto the motherboard and insert the pushpin assembly through the mounting holes in the motherboard inserting some locking pins into the pushpin assembly to lock the RM to the motherboard. Their mounting system doesn’t require you to remove the motherboard from the case and mounting the retention module to the motherboard is painless and quick. After the RM is secured to the motherboard, you have a bracket on the bottom of the heatsink that has holes in it that correspond to holes in the RM frame to simply screw the heatsink down to the motherboard. Note: unless you are taking the heatsink out of service permanently, the RM frame can stay mounted on the motherboard since you just have to unscrew two screws in the mounting plate to remove the heatsink for cleaning. 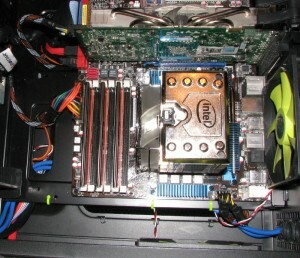 A very nice solution for Intel mounting. It doesn’t use a backplate, which I rather have for heatsink mounting, but their mount seems to spread the load a little better around the socket area than the Transformer 3 mounting hardware does. For mounting on AMD systems the procedure is a bit different. Instead of using a custom RM like with Intel boards, Arctic Cooling decided to use the stock AMD RM and adapt the mounting hardware instead. They included two angled metal pieces that secure to the hard mounted tension plate on the heatsink with a screw for each. These two metal brackets have holes cut in them that engage the hooks on the sides of the stock AMD RM. You simply set the heatsink in place on top of the processor, fit the angled plates to the hooks and tension plate, then screw the angled plates to the tension plate. The bad part about this mounting system is that it will only mount the heatsink in a north-south orientation. 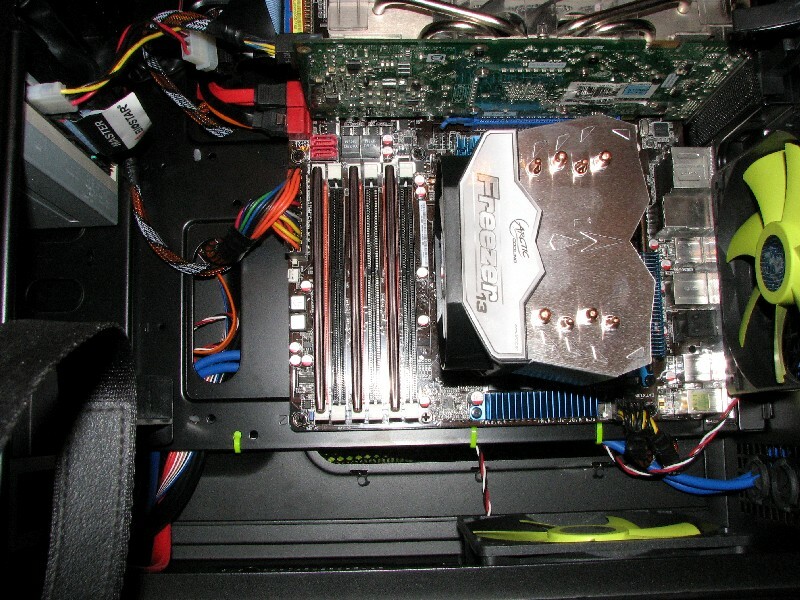 So you have the heatsink blowing at either the top of the case or at the video card. 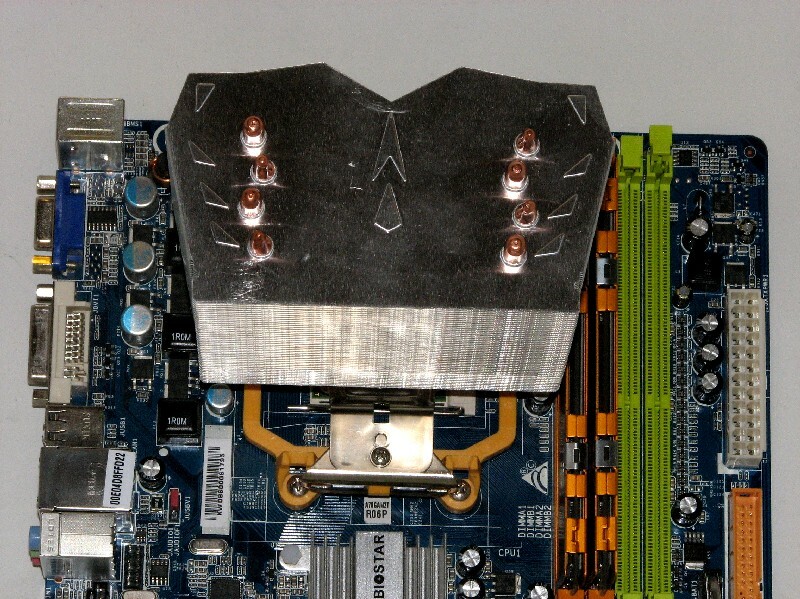 To me, the AMD mounting system that Arctic came up with for this heatsink isn’t nearly as nice as the one they came up with for Intel systems. It’s more of an afterthought to me and the lack of being able to orient it to blow from the front to the back of the case hinders it’s use on AMD systems. 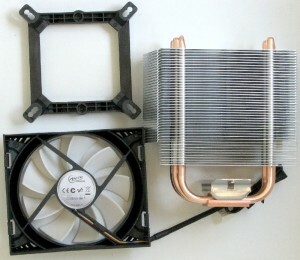 Since this heatsink seems more directed towards better cooling than the stock Intel or AMD heatsink than trying to meet or beat the other high performance coolers on the market, I decided to test two OEM Intel LGA1366 coolers I have to compare the differences between them and the Freezer 13. 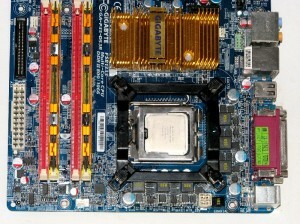 The first is the stock round heatsink that Intel throws in their non-extreme series retail model LGA1366 processors. 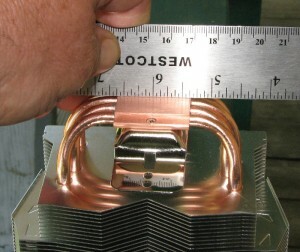 Total installed mass of this heatsink is 502.4 grams. 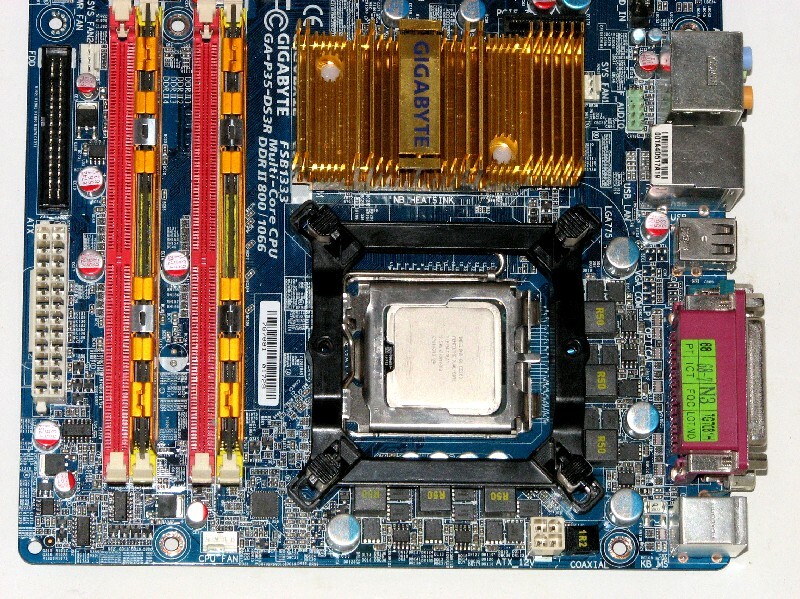 It has a copper core, but no heatpipes and besides the size of it, it’s mostly like the models that Intel equipped their Core 2 Quad processors with. The second OEM heatsink I will test is the one that came with my i7 980X Extreme processor which looks somewhat similar to the Freezer 13. The Extreme series heatsink is normally not sold in retail but sometimes you can find them for sale on eBay and I even found them for sale at Scan.co.uk for a very good price (when in stock). 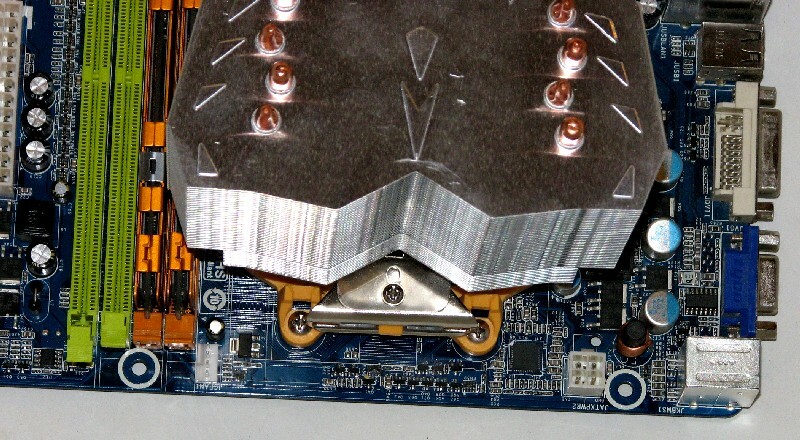 Also, this is the first Intel OEM heatsink I’ve seen that actually uses a backplate and screw setup instead of those damned pushpins; thank you Intel. 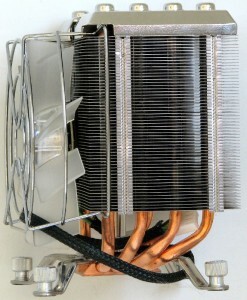 This heatsink uses four 6.0 mm heatpipes bent in a U and soldered to the base. 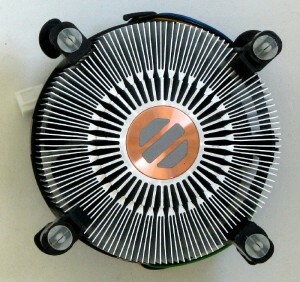 It has an unshrouded 92 mm proprietary fan that is mounted with special mounting hardware within the heatsink. 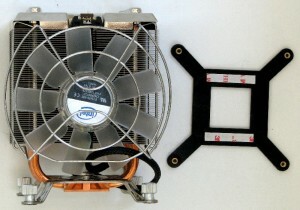 The fan on this unit is a two speed model, with a high speed setting for maximum cooling and a lower speed setting for quiet (PWM controlled) and has blue LED lights. 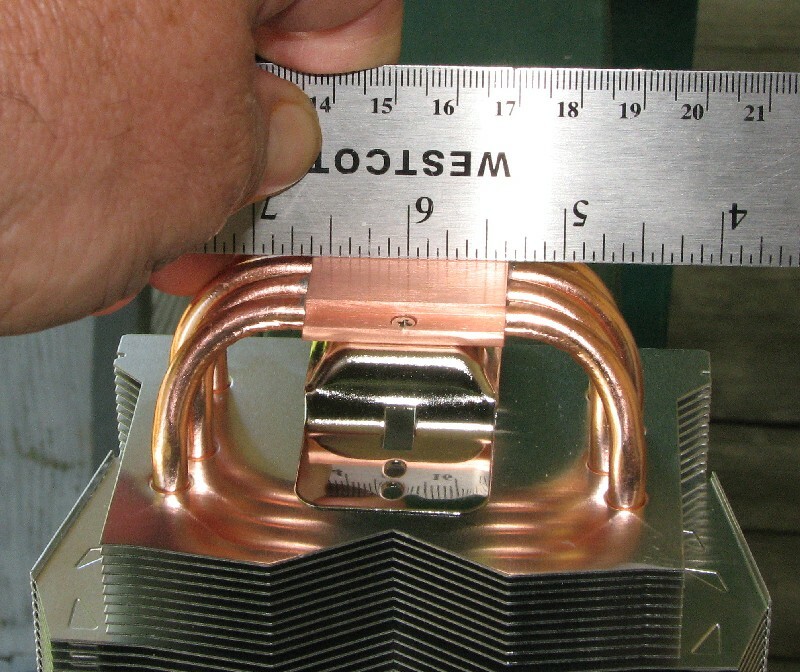 This heatsink has a total installed mass of 652.0 grams. In testing, I found the high speed setting to be pretty noisy and a bit buzzy/rattling, but effective. Since the Arctic Freezer 13 uses a proprietary fan designed to fit the heatsink itself, there is no way to test it with any other fans. So what you see is what you get performance-wise. The specifications that Arctic gives on the fan are listed above in the specifications. 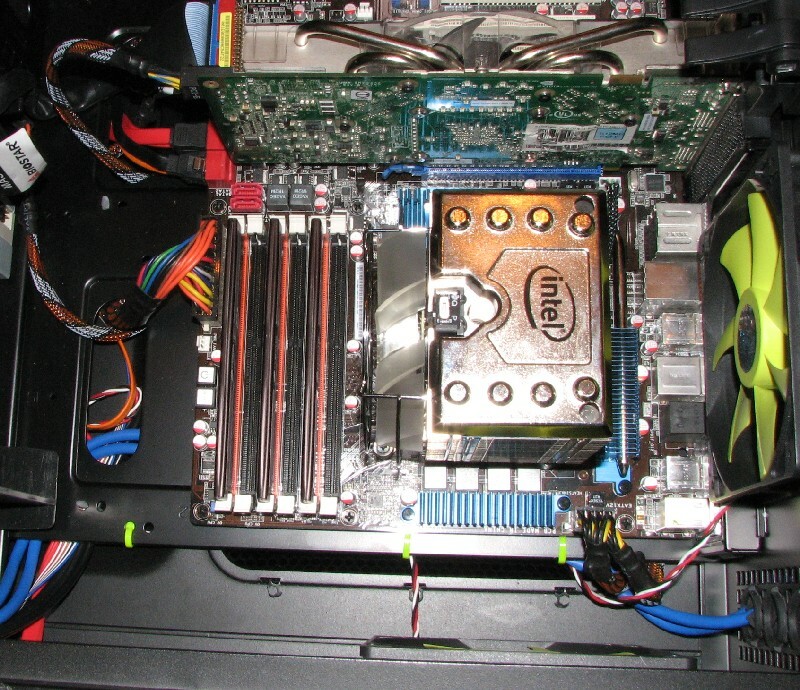 Processor – Intel Core i7 930, overclocked to 4000 MHz @ 1.304 v under Prime95 load. Secondary run settings are at 3600 MHz and 1.128 volts Vcore under load. Arctic MX-2 thermal paste was used for testing as I have found it to give consistent results with no appreciable break in and it applies and cleans up easily. The testing methodology used is the same as my previous reviews. All energy saving features of the motherboard and processor were turned off to keep it from down clocking the processor speed and vcore. All fan control functions were turned off in bios to keep the fans at maximum speed. For processor temperature monitoring purposes, I am using Real Temp 3.46, with logging enabled at 2 second intervals. For room temperature monitoring, I am using a Fluke Model 52-2 and using a “K” type thermocouple that is inserted into the case front where the front intake fan is mounted. The Fluke records the maximum, minimum and average temps during the run at 1 second intervals. Temperatures in my computer room were maintained as close as possible to around an 18° C average during the run, as measured at the lower front intake fan by the Fluke. At the end of the test run, I logged the maximum, minimum and average temperature. The maximum and minimum temps are given as recorded by Real Temp, but the average temperatures have been adjusted to a constant 18° C as derived from the Fluke average temps. For loading the CPU, I used Prime95 version 25.8 using in-place large FFT’s and ran it for 30 minutes to stabilize temps. After 30 minutes I would exit Prime95 and let the CPU idle for at least 10 minutes. The highest recorded temperature from the hottest core for each run was then recorded off of the Real Temp log, the lowest temperature on any core was recorded and the average temperature on the hottest core was calculated during the load portion of each run. 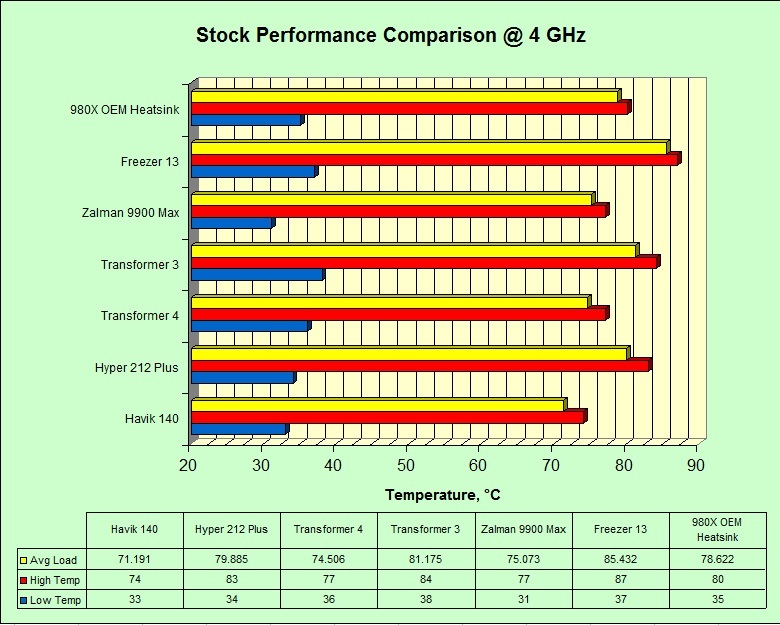 As you can see from the above chart, the stock OEM i7 930 heatsink is being pushed pretty much to it’s limits even at this relatively mild overclock. 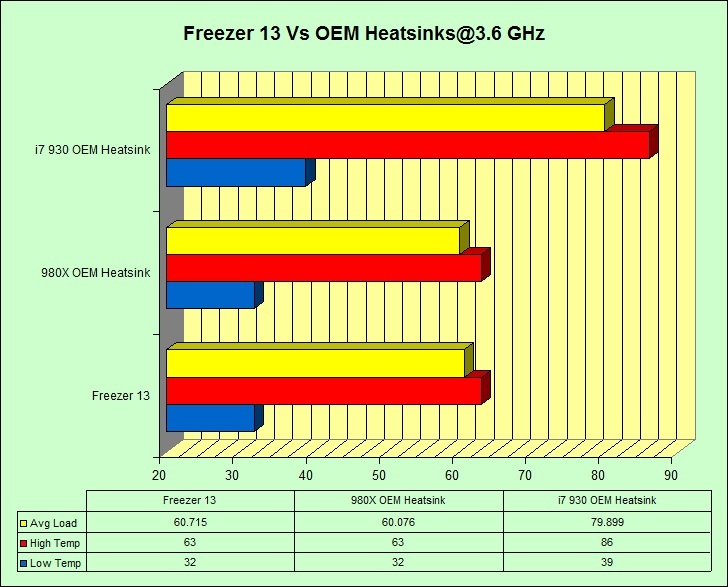 Both the Freezer 13 and the 980X heatsinks fare much better and at this level of overclock they are running neck and neck for cooling performance. Next, we will chart the Freezer 13 against the 980X heatsink at 4 GHz, which is my normal testing overclock and loads the heatsinks to a bit over 200 watts of heatload. 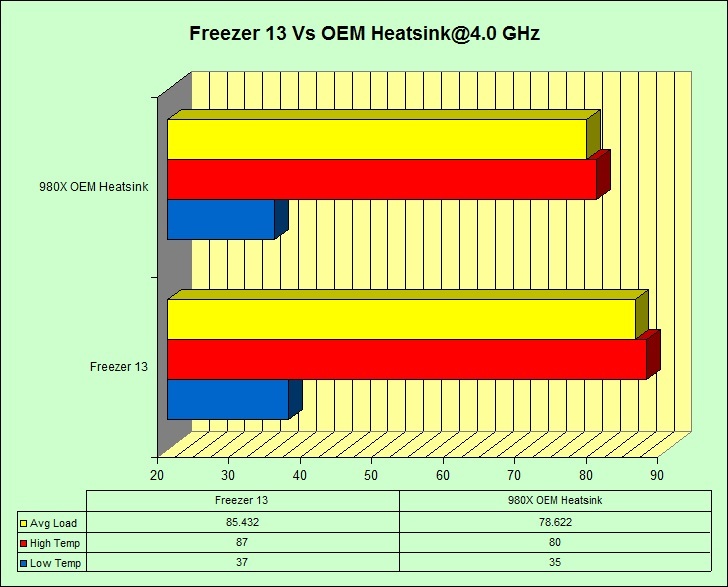 At this level of overclock we are now seeing a difference in performance between the Freezer 13 and the 980X heatsink and sadly, the Freezer 13 is coming up on the short end of the stick. At this level of overclock, the Freezer 13 is just about as far as it can go with cooling whereas the 980X heatsink is handling this heatload a lot better. I personally wouldn’t want to run my processor at the temps that the Freezer 13 is keeping at this level of overclock for day to day usage, but would consider the 980X to be adequate for day to day usage at it’s recorded temps. The Freezer 13 is quite a bit quieter heatsink with it’s fan as compared to the 980X heatsink, but there is no easy way to install a higher performance fan on it either, if noise doesn’t bother you. As you can see, the Freezer 13 is trailing the pack and is being bested significantly by it’s direct pricing competition, the Cooler Master Hyper 212 Plus. The Hyper 212 Plus can commonly be found selling for around $30 or less. It is also being beaten by the Evercool Transformer 3 and significantly beaten by the Evercool Transformer 4 and both of these heatsinks are also selling in the general price range of the Freezer 13. 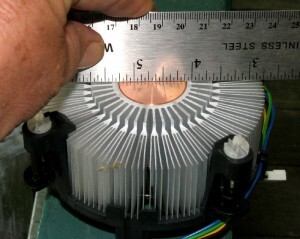 All three of those heatsinks have gone with using a 120 mm sized fan(s) instead of the 92 mm sized fan of the Freezer 13. The only way I would choose the Freezer 13 over the others would be if I had a space-constrained case that couldn’t fit a taller heatsink inside of it. 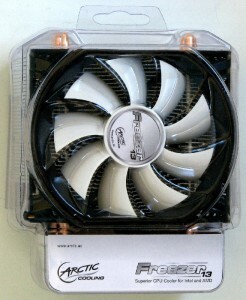 Looking around the net, you can generally find the Arctic Freezer 13 selling for around $33-$36 shipped. And you can still find the Hyper 212 Plus selling for less than $30 new from several stores and the Transformer 3 and Transformer 4 can be had for around $40 and $45 shipped respectively. 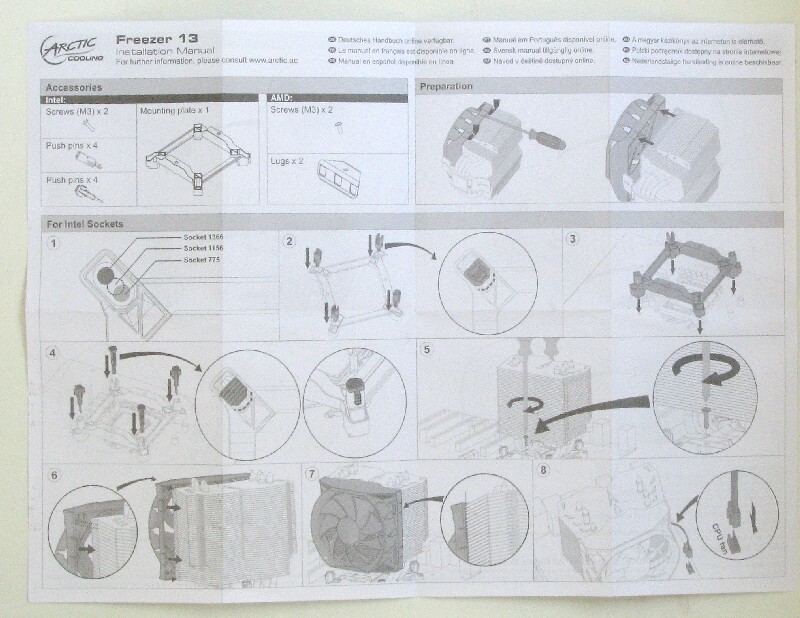 With competition like that, it is hard to recommend the Freezer 13 unless you have a space-constrained case that won’t fit a more efficient heatsink. 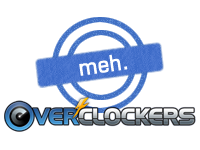 And so, I find the Arctic Freezer 13 only earns itself an Overclockers Meh rating. In closing, I would like to thank Arctic for supplying me with the Freezer 13 review sample as well a new tube of MX-2 thermal compound which I use for my heatsink testing. 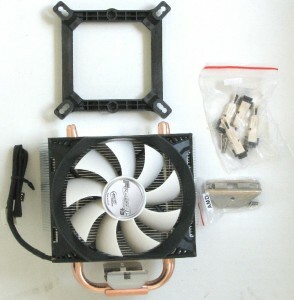 Your Intel mounting system for the heatsink is nice and the fan is quiet enough, but you are getting beaten in the price/performance realm by other coolers in the same market segment . It is adequate for mild to moderate overclocking, but you can get better performance for the price from the competition. For a hot ambient user without a deep caes and no money to upgrade to a performance case, it's almost... good. Thanks for the review, sorry you had to reviewit, doing the top stuff reviews is so much more fun. Opened eyes to what really matters. I 'hates' on marketig hype. 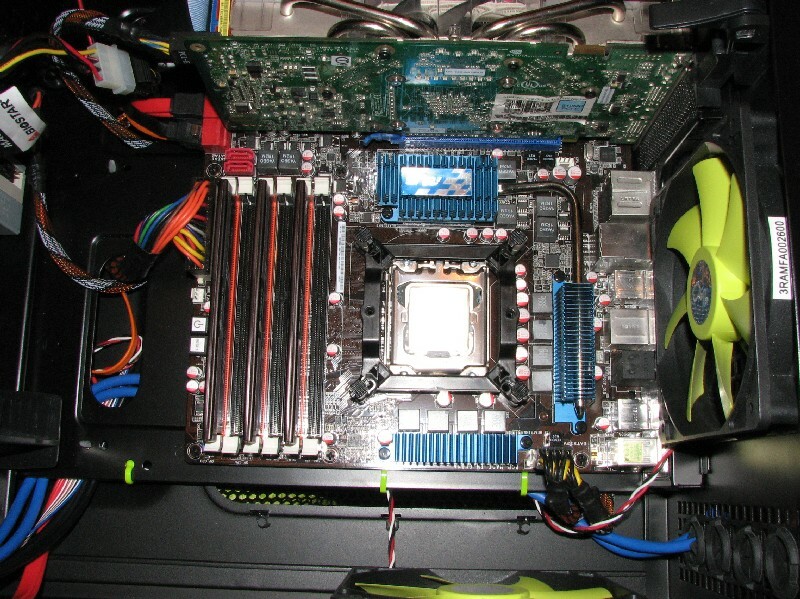 did a build for my friend with this heatsink the other day. it was a pain to put on with an AMD system, however it did hold pretty dang good temperatures! hopefully i can get a little more juice out of the system overclocking it! it holds cold enough temperatures to get a pretty decent overclock! Yeah, it is a bit of a pain to install on AMD and I don't like the fact that it won't let you orient the heatsink the way you want to orient it. 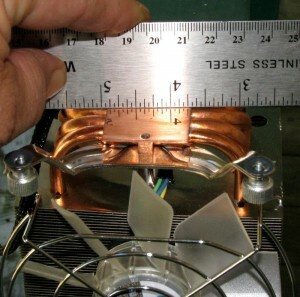 That is where the Hyper 212 just kills this heatsink for AMD systems. The AMD mount for the Hyper 212+ is designed to where you can orient to mount either in a north-south or east-west configuration. And I didn't test cooling on AMD, but would assume that it should work adequately and even give you some overclocking headroom. After all, it was able to cool that Bloomfield I test with at 4 GHz, which is no mean feat in itself. Well it works great on a 2500K with standard height ram (had toreplace my tridents) and keeps temps good up to 5+ with a well vented case. I'm glad to hear it's working well for you, Archer. I figured it would work well on a 2500k, since it's not nearly the heat monster that Bloomfield turned out to be. :thup: And while I found their AMD mounting system to be somewhat lacking, their Intel mount is definitely first class.